Front cover and title-page of the 1870 dramatic version of No Name. This copy was presented to the actor, G. F. Rowe, in January 1872. No Name was never produced as a play in England although there were two different adaptations. The first version, No Name: A Drama in Five Acts (60 pp, pink paper wrappers), was written by W. B. Bernard in 1863: Collins hoped this would be produced at the Olympic Theatre. 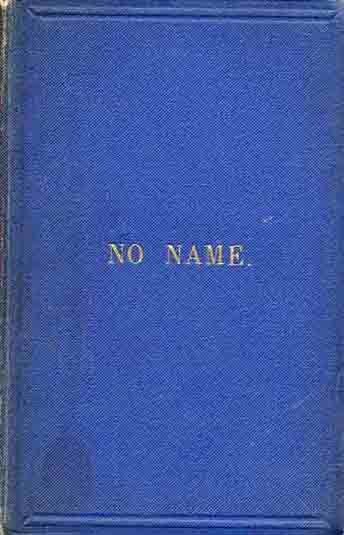 The second, No Name: A Drama in Four Acts (160 pp, buff paper wrappers), was written and published by Collins himself in 1870. In New York, this version was altered by Wybert Reeve and produced by Augustin Daly at the Fifth Avenue Theatre, with the first night on 7 June 1871. Reeve eventually took his dramatisation to Australia. 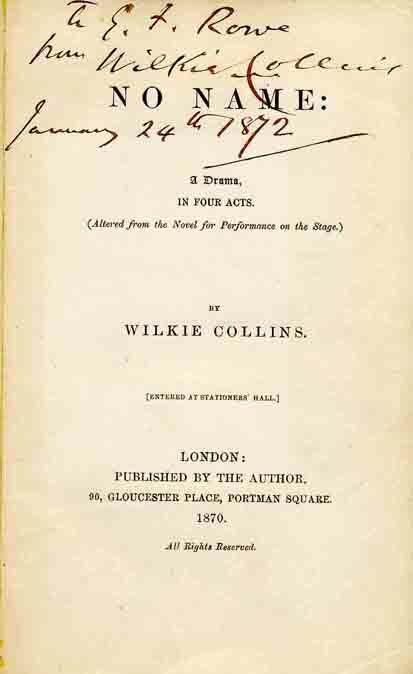 The 1863 text was also published in De Witt's Acting Plays (Number 104), New York [nd].